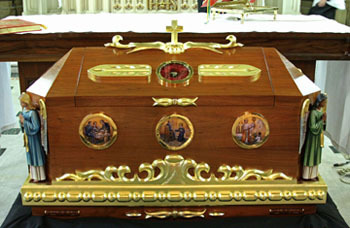 The Redemptorists are honored to bring the relics of our confrere, St. John Neumann, to the Basilica of the National Shrine of the Immaculate Conception in Washington, D.C. on March 28. Exposition of the reliquary of St. John Neumann coincides with the 201st anniversary of his birth (March 28, 1811) and the 160th anniversary of his consecration as a bishop (March 28, 1852). The traveling reliquary — which includes a first-class relic — will be welcomed at the 12:10 p.m. Mass in the Crypt Church by Monsignor Walter R. Rossi, rector of the National Shrine and celebrant of the Mass; Redemptorist Father Matthew Allman will be the homilist. Following the Mass, veneration of the relics of St. John Neumann will continue throughout the afternoon and will end with Mass at 5:15 p.m. at which Father Allman will preside and preach. In January 2011, the Redemptorists kicked-off a special year marking the 200th anniversary of the birth of this first male American saint and the founder of the Catholic parochial school system. The Neumann Year included themed parish missions and retreats, the celebration of 40 Hours Eucharistic Devotion, a nationwide essay contest for Catholic school students, and the relic tour. The traveling reliquary made stops in several locations including Old St. Patrick’s Cathedral in New York City; St. Alphonsus Church in Baltimore, MD; Buffalo, NY; the Diocese of Trenton, NJ; and several parishes throughout Pennsylvania. The relics will make a final stop at the Malvern Retreat House in Malvern, PA prior to the closing celebration of the Neumann Year on June 23, at the Cathedral Basilica of Sts. Peter and Paul in Philadelphia.